Publicity Stills of "Pride & Prejudice"
Set during the class conscious 18th Century, Pride and Prejudice is based on Jane Austen’s classic tale of love and the ironies among the English gentility. News of the arrival of two distinguished gentlemen Mr. Bingley and Mr. Darcy reaches the Bennet family whose two eldest daughters Jane and Elizabeth are eligible for marriage. Jane is immediately taken with Bingley but Elizabeth finds the proud Mr. Darcy very disagreeable. She later discovers that there’s more to the seemingly arrogant Darcy than first meets the eye. Whoever said literature is boring should watch the film adaptation of Jane Austen’s classic, Pride and Prejudice. An 18th century love story filled with desperate, spunky and taciturn characters, it will charm with its depiction of the period. It has been ten years since the television series of the book ran on BBC. The series is also known for making Colin Firth THE very Mr. Darcy described in the books. There is much weight on the shoulders of the film. Matthew MacFadyen has a task similar to Christian Bale and Daniel Craig; stepping into the shoes of a character already made famous by other actors. Keira Knightley brings a different charm to Elizabeth Bennet and Joe Wright, in his directorial debut tackles a beloved literary classic. “You may for ever tarry,” the last line of Robert Herrick’s poem, To the Virgins to Make Much of Time, quite simply describes the attitude towards marriage in 18th century England. As written in the book, there also existed the idea of a man of fortune would want a wife for himself. This made romance false and marriage more like a business having mothers like Mrs. Bennet (Brenda Blethyn) around. She wants to see her five daughters being married off to men of wealth who can support each one. But of course there are fears that they will not marry. In trying to marry them off in order from the eldest, she provides much comic relief with her over-the-top antics and complaints about her nerves. When the wealthy gentleman, Mr. Bingley arrives in town, Mrs. Bennet wastes no time in getting eldest daughter, Jane (Rosamund Pike), acquainted with him. The whole family attends a dance graced by Mr. Bingley who has brought a friend, Mr. Darcy. While Jane and Mr. Bingley hit it off immediately, one can sense the animosity between Elizabeth and Mr. Darcy. It did not help that Elizabeth herself overheard Mr. Darcy lamenting that she was not handsome enough to tempt him. If they had any feelings for each other, they must have been clandestine. Elizabeth and Mr. Darcy have chance meetings as the story progresses but most of them end with one walking out of the other. To add to the complications, two potential suitors emerge in Elizabeth’s life. While one proposed to her, the other brought much trouble in the form of Officer Wickham who felt was cheated by Mr. Darcy of an enormous fortune. This made things worse considering she had already felt Mr. Darcy had sent Mr. Bingley back to London to the latter from marrying Jane. Elizabeth and Mr. Darcy eventually dance after her initial request at the first dance was turned down. While they appear cold towards each other, they are caught in their own world as they converse while dancing. Somehow, in a magical moment, everyone else disappears, leaving the two of them. This, if any, justified their feelings for each other, though not being able to see it themselves. Misunderstandings and arguments are part and parcel of love. Fearing that he will eventually lose Elizabeth if he does not open up to her, he chases Elizabeth as she walks away in the rain. In this memorable scene, Mr. Darcy appearing to be the more vulnerable one, lets his guard down and professes his love for Elizabeth. But with every love story, things are never that simple. The pairing of Elizabeth and Mr. Darcy is such a pleasure to watch. If any, they truly epitomize the adage that opposites attract. Keira Knightley has found the role that will define her career. As Elizabeth Bennet, she makes this film the most modern adaptation of Jane Austen’s works to date. Her semi-tomboyish and spunky nature sets her apart from her other sisters and this is also noted by her father, Mr. Bennet (Donald Sutherland) in the book. Matthew MacFadyen, undoubtedly is the new Mr. Darcy. Quiet and brooding, he explains that he is not the type to talk to new people. But when he reveals his true nature to Elizabeth, one must admit that there is much warmth afterall beneath the freezing exterior. The rest of the cast complements the film. The sisters are all excellently casted although Kitty and Lydia might appear irritating. Donald Sutherland’s portrayal of the amused Mr. Bennet must be singled out. 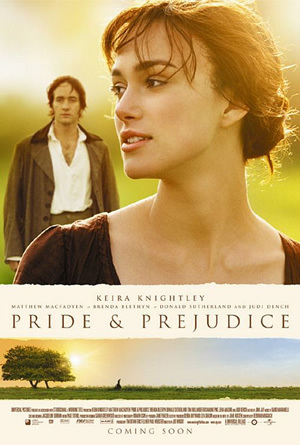 In a scene with Elizabeth who reveals about Mr. Darcy’s true nature, Mr. Bennet will remind one of Sutherland’s character from the Academy Award winning Ordinary People. Pride and Prejudice might be a dark horse at the Oscars race. Still, if its any consolation, awards galore are bound to rain on the film come Golden Globes season. Flaws are far and few in this film, Joe Wright should thank his lucky stars. Pride and Prejudice does not deal with puppy love. It is about romance between two people who never realized they were born made for each other. Jane Austen’s book is a fantastic read but the film is a brilliant campaigner for romance. If you want to know what love is truly about, bring some tissue and a partner, watch Pride and Prejudice and leave feeling how blessed it is to love.